So it appears we have a potentially significant winter storm on our hands. Of course it depends on your definition of "significant." 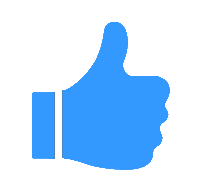 I'll give a brief general description initially then get into more detail further below on this blog. Anyways, snow is likely to develop across much of western Wisconsin Thursday then into northwest Wisconsin as we head into early Friday morning. The exact location of where the heaviest snow is still up in the air by the order of tens of miles, but we think a narrow strip of heavy snow will fall from the Ellsworth area up through Hurley and adjacent locations in the upper peninsula of Michigan. Once the snow tapers off, we'll be greeted with another healthy dose of cold arctic air that settles in for a few days starting Friday. displayed in the light pink coloring. With these low clouds in place overnight, temperatures weren't able to decrease like one would typically see overnight. This also means daytime highs will struggle to increase since the incoming solar radiation can't reach the surface. These low clouds will stick around up until the storm system passes Friday. 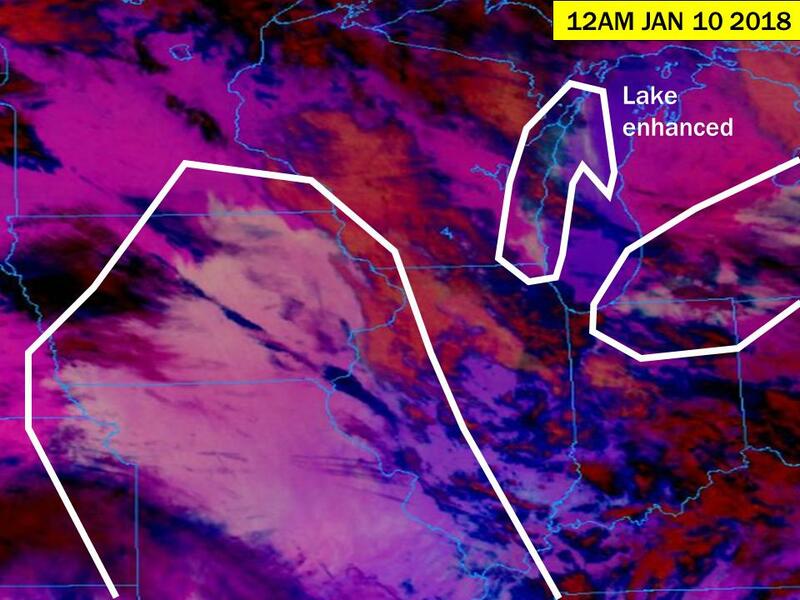 This can have interesting implications on snow amounts in western Wisconsin in which I'll touch on later in this blog. 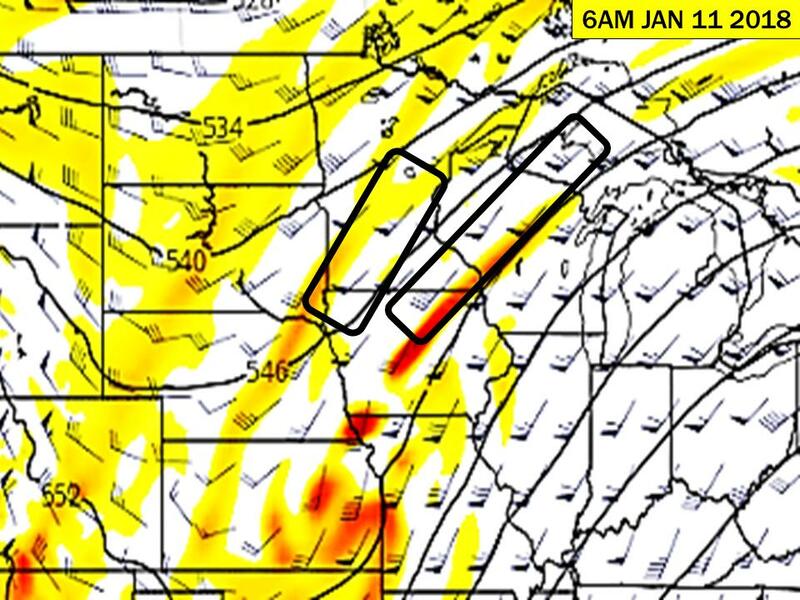 We'll also be seeing more abundant mid-level clouds around the upper Midwest prior to this storm due to low level (850mb level) warm air advection (WAA) highlighted in red. When WAA occurs, it enables rising air parcels (warm air rising over cooler air sense warm air is less dense than cold air.) 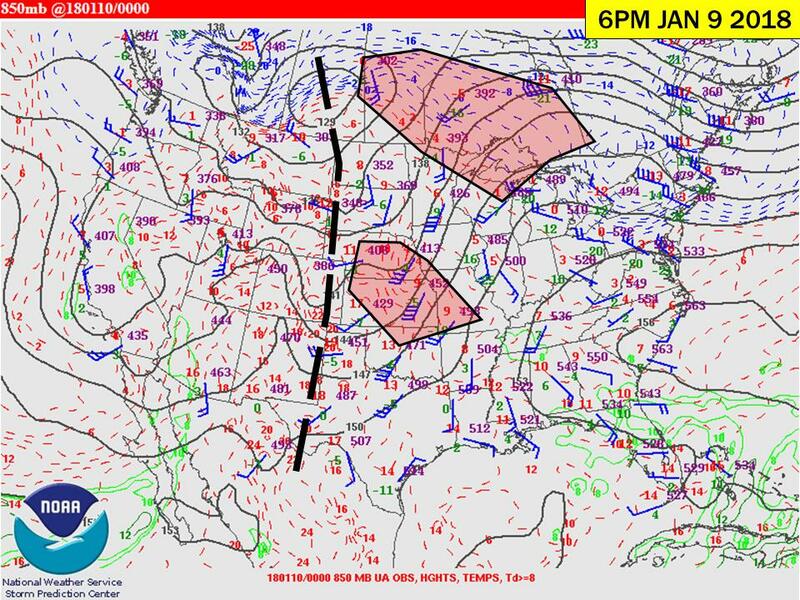 The dashed black line indicates approximately where 850mb is located within the lowest 100mb to the surface--areas west of this line have 850mb within their boundary layer (where friction has a large influence on processes) or even below ground. Those gosh darn mountains and such. 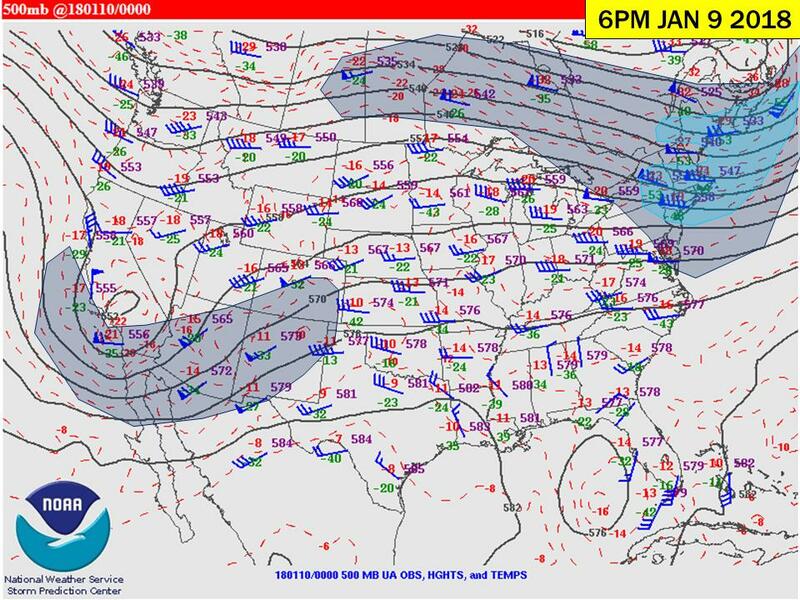 So essentially I don't look at anything in the 850mb layer or lower west of the high plains. 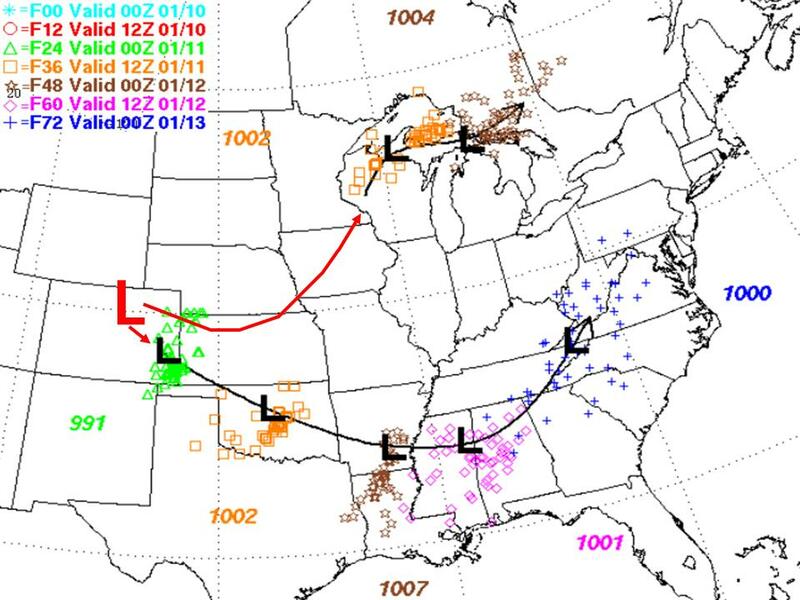 The 700mb map also shows a broad area of WAA which encompasses much of the northern plains/upper Midwest. Let's move on up to 500mb now. 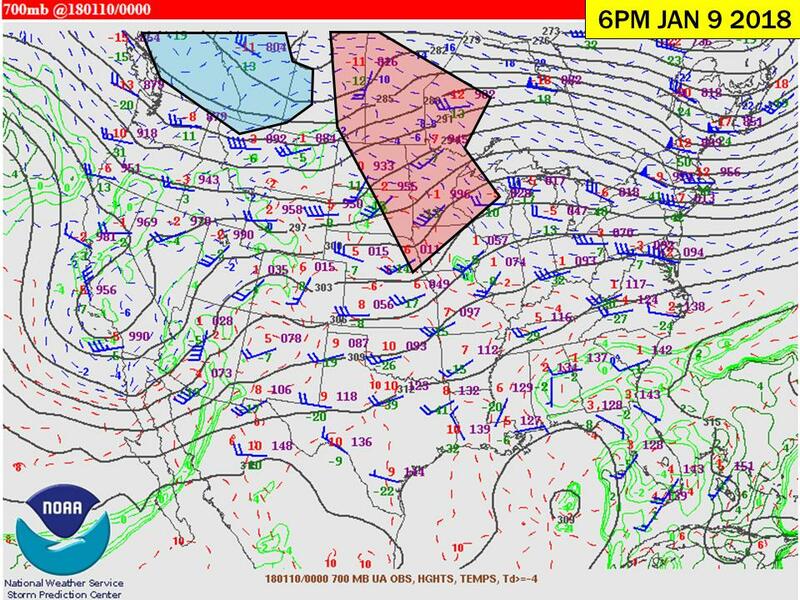 There are two main troughs that are located on the opposite corners of the lower 48. The eastern trough that's almost a "fish storm" which will have minimal effect on our weather in the near term, meanwhile the approaching trough and associated closed low located over southern California has different plans. I shaded in the isotachs (lines of equivalent wind speeds) if 50kts (and greater) were reached with a new color every additional 15kts. This gives me a good idea on how strong and dynamic the system is. 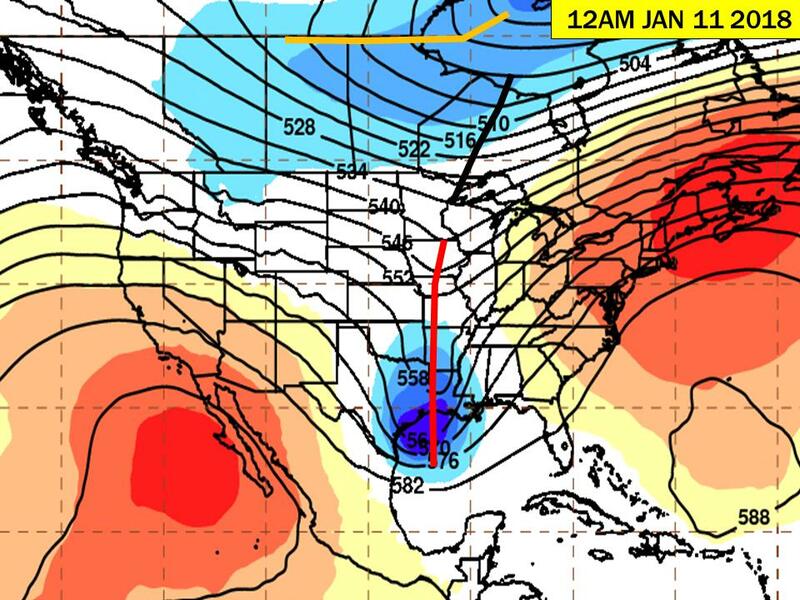 The following image is an analysis of the 250mb level (usually jet stream level this time of year.) So now we're looking at ~35,000ft up in the atmosphere where those airplanes fly. What I have circled in (I know it's an ellipse) is the jet that will have the biggest influence on our weather in the coming 36 hours. This feature will propagate northeastward with time and will favor lee cyclogenesis (development/strengthening of a low pressure system) near the surface on the leeward side of the Rocky Mountains. As you'll see later in this blog, two main areas of low pressure will develop because of this evacuation of mass process--where favorable divergence aloft initiates surface convergence. Mid-latitude cyclones tend to develop in the right-entrance region and/or left exit regions of jet streams. 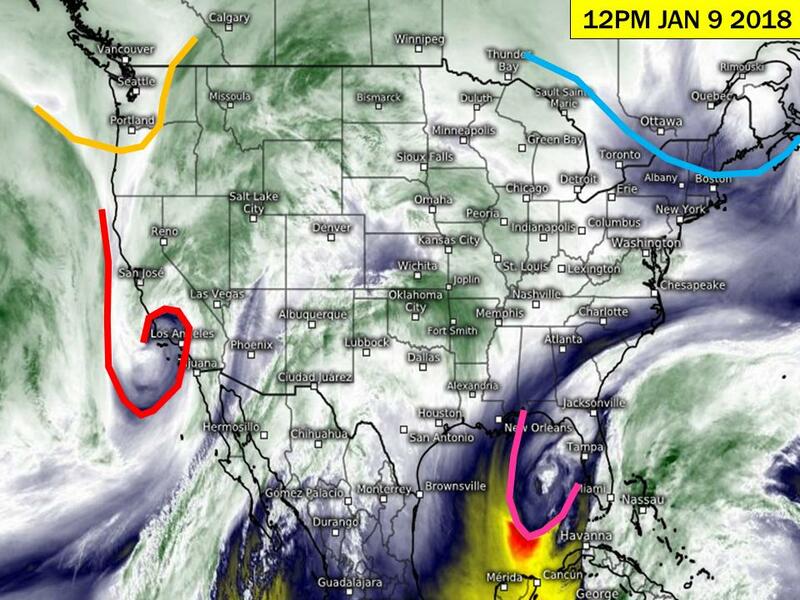 Now I hate to do this, but I'm going to be assigning different colors to the different troughs on the following images (not consistent with the colors from the water vapor imagery.) 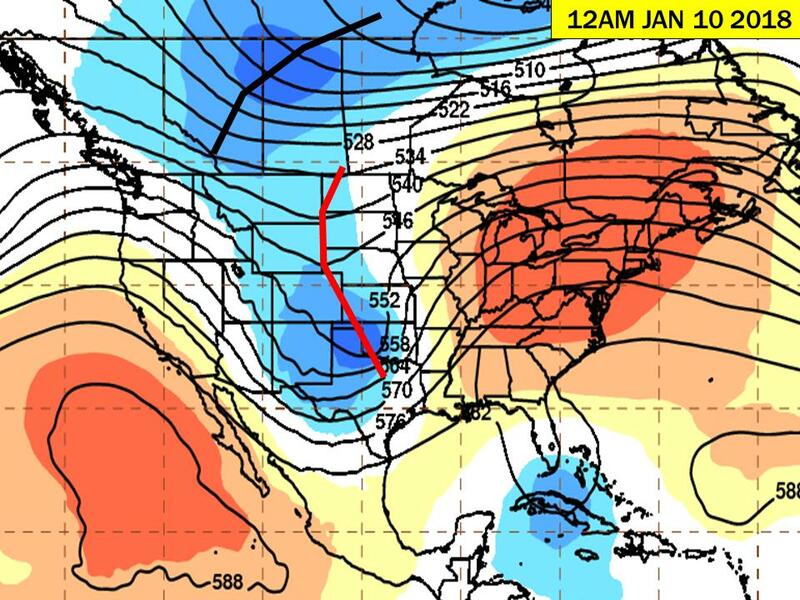 We'll initially have 2 troughs: Black trough and red trough. 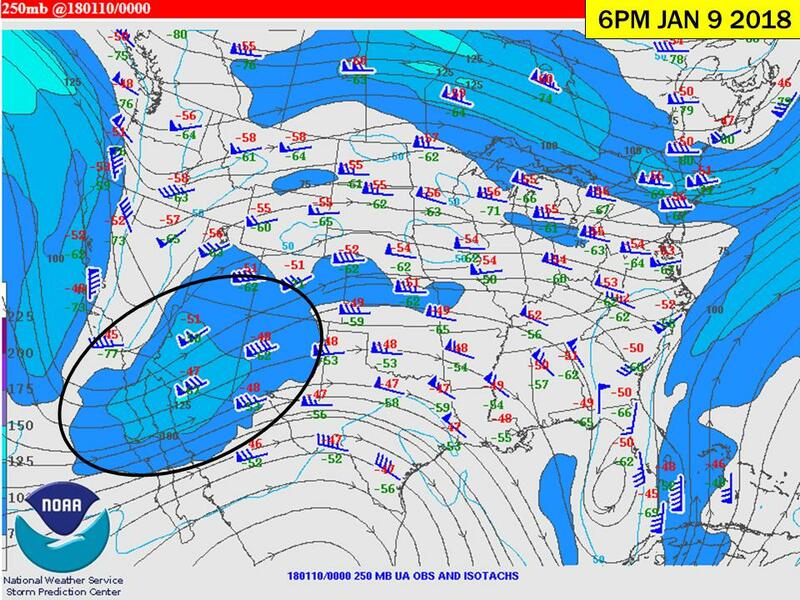 Black trough initiates northwest of red trough over the Canadian Rockies. 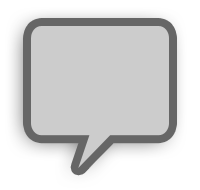 Since black trough has a smaller amplitude, it will be able to move quicker with time. Black trough will eventually phase with red trough in the early morning hours of Thursday as they propagate through the nation's midsection and adjacent southern Canada. The timing of this phase is interesting and could perhaps add an extra punch of winter weather to Wisconsin if other conditions are favorable (right now that's not looking likely.) Red trough will be moving slower across the lower 48 since its amplitude is much larger (more meridional flow upstream/downstream of its axis.) 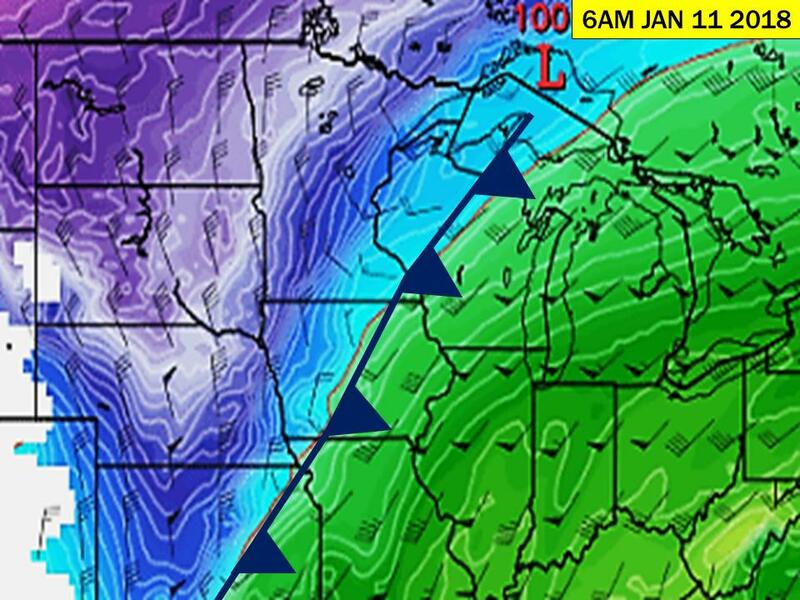 This trough is the one associated with our surface low that'll be drawing up moisture from the south. This excess in moisture will have snowy implications once its able to condense into ice crystals (we'll talk about this later on.) As these two troughs move across North America, gold trough develops in arctic Canada and will be the one that holds back the cold until Friday. Eventually, black trough will ride that downstream ridge that'll be located over the northern Atlantic Ocean and will take on a similar path as the trough that's currently over Nova Scotia. Gold trough swoops on down through the northern plains/upper Midwest and will yet again leave us questioning in its wake why we live in a place where the air hurts our face. Rhyme not intended. Wind chills associated with the arctic air could easily approach -25F to -30F sometime this weekend so bundle up if you're going somewhere to watch the Viqueens/Saints. 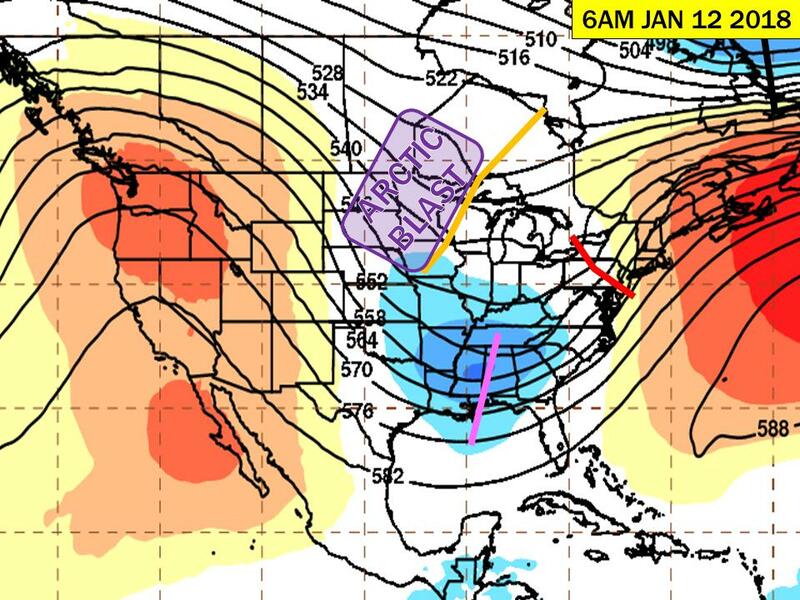 Pink trough forms on the western periphery of the longwave trough and will be impacting the Ohio Valley region with snow, sleet, and rain later on in the weekend. Next I'll take a look at a forcing mechanism that favors (intense) narrow snow bands. This mechanism is called "frontogenesis" and means the strengthening of a frontal boundary due to the temperature gradient becoming tighter. This can be done in the low levels of the troposphere, anywhere from 925mb-700mb (3,000ft-10,300ft above sea level.) The following map is an 850mb temperature map and I plotted the obvious cold front that stretches from Lake Superior through the central plains. On the westward side of this frontal boundary, cold air advection (CAA) is occurring...and it's strong. Meanwhile on the eastward side of this front, the wind barbs are essentially parallel with the isotherms so neither warm/cold air is being advected. However, since the warm side isn't getting any warmer OR colder, and the cooler side is becoming increasingly colder, this temperature gradient should tighten some still with that added sinking in place. This means a narrow, intense snow band is possible to occur due to strong upward vertical motions along the frontal region. This can also be seen in the 500mb vorticity map. The response of this frontogenetic process is producing high values of relative vorticity (oranges and reds.) The two regions I outlined have potential for higher snow intensities due to cyclonic vorticity advection occurring--another lifting mechanism. The duration of these higher snow intensities are up in the air since this system seems to eject rather quickly and tries to become embedded in aforementioned black trough. If the northern stream and associated trough eats this surface low up it'll be out in Ontario in no time. LEFT: Forecast 850mb temp map. showcased a good example of the global models having a hard time picking up how "friendly" the northern jet stream and the southern stream were going to be with each other (5 days earlier.) 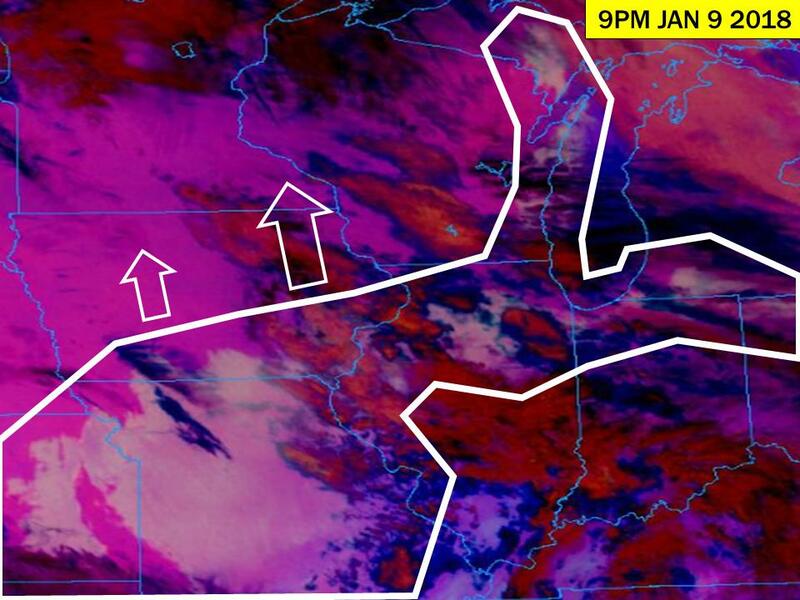 Some runs had both streams working well together as one system and that solution brought one deepening surface cyclone across the upper Mississippi River Valley and output over a foot of snow to a wide area. As runs went by models were able to see both systems working separately and consistently independent from each other. If the initial solution would've verified, this would've been the snow storm that everyone was waiting for...but alas we'll have to wait again for the next western trough to give us our next chance. How anomalous is this system when it comes to available precipitable water (PWAT)? The map on the left highlights Wisconsin in the lighter green shade with higher amounts to the south. Those values you're seeing range from .5" to ~.8" which are well above the 90th percentile for this time of year across Wisconsin. 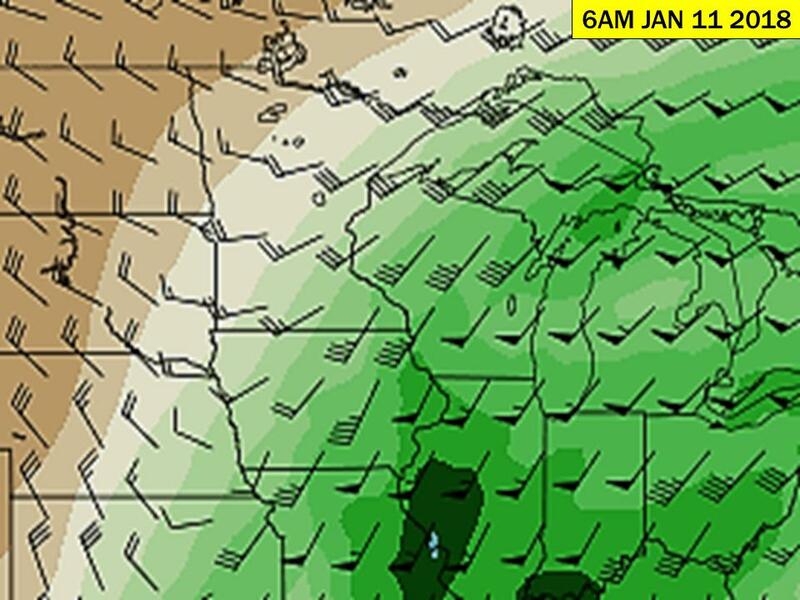 NWS GRB (Green Bay) record PWAT for Jan 11 is .84" and we may very well see that record broken tomorrow. Since it's fairly obvious we have the moisture in place, how much QPF (quantitative precipitation forecast) are the models spitting out? 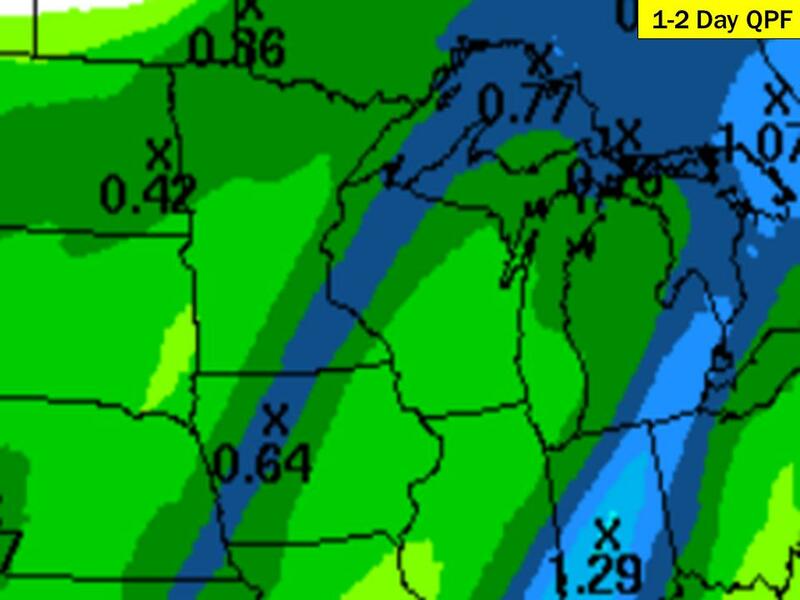 This following map displays a narrow swath of QPF greater than .6" that stretches from southeastern Nebraska up through southern Ontario (basically where the frontogenesis is occurring.) Lets store that .64" plotted over northwest Iowa in the back of our memories for the next couple minutes. You can also note the impressive QPF swath over the Ohio Valley associated with the next system as that low pressure pulls in deep moisture from the Gulf of Mexico. With this narrow band of QPF in mind, lets take a look at some forecast soundings! Where the temperature and dew point lines are beyond 3C-4C degrees apart from each other, you have a dry layer present. The green boxes indicate where the saturated/cloud layer resides, and the brown boxes show where the dry layers reside. The sharp inversion of temperatures at around 39,000ft (~210mb) is where the tropopause is located. This is a logarithmic chart so the pressure levels increase in distance from the next as you increase in height. Since clouds rarely occur in the stratosphere (aside from stratospheric-penetrating convection) the temperature/dew point profiles stay apart from one another. Using the classic top-down method, there's a saturated layer that extends from 200mb down through 370mb. The -40C isotherm runs right through that layer, so that cloud layer is made up of only ice crystals--this is how we know this is a cirrus cloud. It's important that we get these ice crystals to the ground so snow can be efficiently produced. But we can't quite yet get snow to produce with that large dry layer from 370mb - 860mb. The dendritic growth zone (DGZ) is also housed in this layer and is completely dry--so ice crystals can't develop through that process. If you experienced fog/drizzle today, the bottom 100mb of this sounding showcases the saturated environment near the ground. Also note that this sounding profile crosses (drops below) the 0C (32F) line at ~860mb then crosses back over above 0C right near the surface. 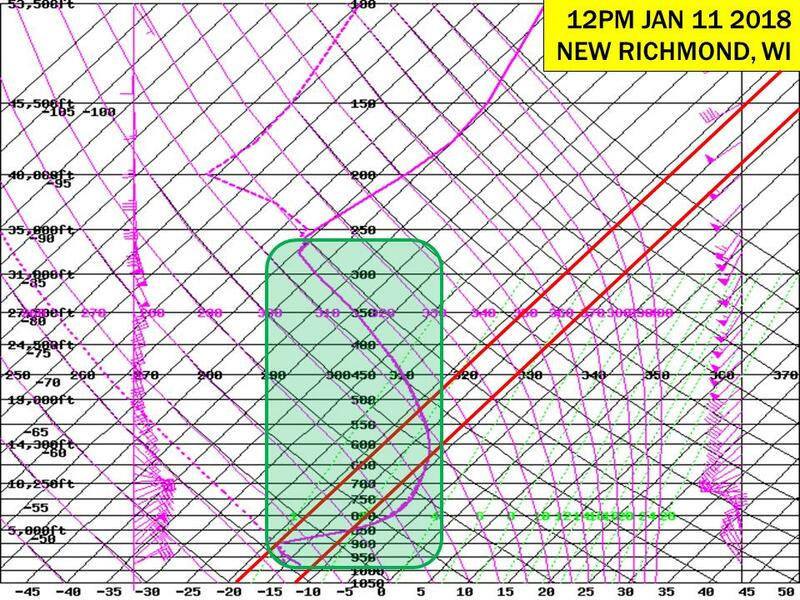 If this saturated layer was about 100mb deeper, freezing drizzle could very well occur. What you'll see overtime with these next two skew-ts is that the dry layer in the mid levels will become entirely saturated implying the DGZ will become saturated. 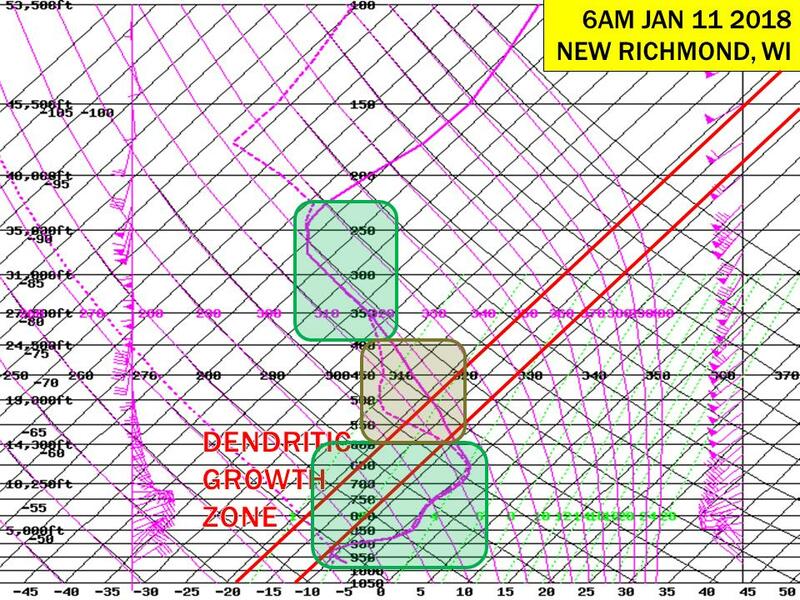 Still dry in the DGZ here, but the sounding profile overall is becoming increasingly saturated. Also note how much colder the thermal profile is. 12 hours ago the profile was above freezing (0C) but now it's entirely below freezing. This type of profile supports collision coalescence-induced snowfall--where super-cooled water droplets collide with one another aggregating into larger snowflakes. This process isn't as sufficient at producing snow as much as the dendritic growth process. Given these initial two soundings, I expect a mix of wintry precipitation overnight in the western Wisconsin region. Once noon on Thursday rolls around, we'll be fully saturated from the tropopause down to the surface--excellent for snow production! The fact that the surface and near-surface temperatures are located in the DGZ also help too. 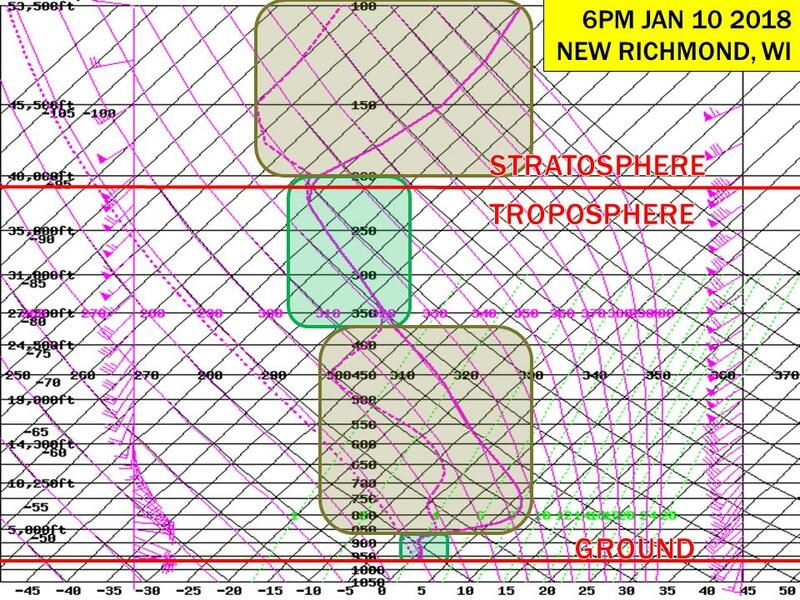 Given the thermodynamic profile of these soundings, we'd be looking at approximately a 15:1 snow-to-liquid ratio (SLR) to perhaps as high as 18:1. 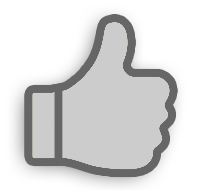 This means that for every 15" of snow that fell, it would equate to 1" of rain once melted. This would support the New Richmond area receiving ~9-10" of snow. At this time this seems slightly too high, and the GFS model has a bias of over-saturating soundings, so I guess only time will tell. 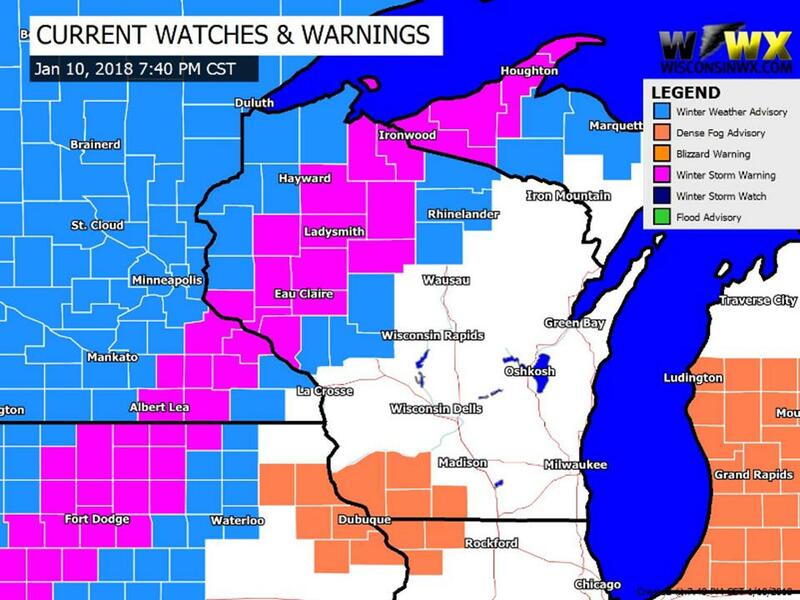 A narrow section of counties in Iowa, southeastern MN, and northwestern WI are now in a winter storm warning through 6PM Thursday. Expect slippery travel conditions as the arctic air makes its way through on the backside of this system which would freeze any water on roadways and other surfaces. 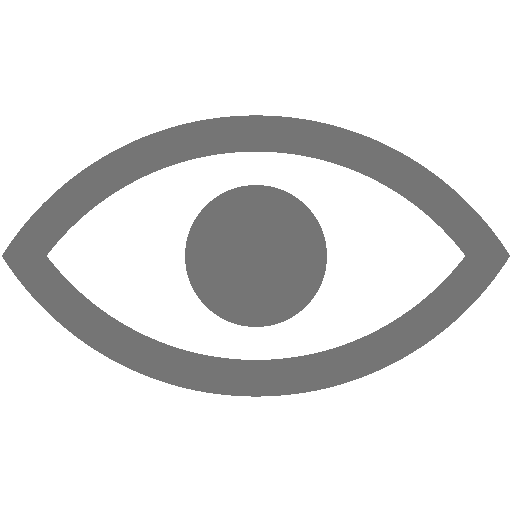 *I will gladly accept and consider any constructive criticism so I can produce better blogging content in the future.